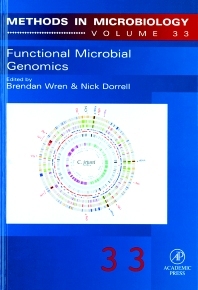 Functional Microbial Genomics, edited by two leading experts in the field, provides the researcher with an up-to-date collection of articles on post-genome technologies central to studying the function of microorganisms. Since the release of the first complete genome sequence of a free-living organism in 1995, over 100 microbial genomes have been completely sequenced. The advent of new technologies for post-genomic analyses has allowed the rapid exploitation of this genome sequence information, heralding a golden era in microbial research. Functional Microbial Genomics provides in-depth accounts from scientists working with these new technologies explaining both the techniques and the ways in which they have been applied to the study of gene function in different microbial species. Methods in Microbiology is the most prestigious series devoted to techniques and methodology in the field. Established for over 30 years, Methods in Microbiology will continue to provide you with tried and tested, cutting edge protocols to directly benefit your research. London School of Hygiene & Tropical Medicine, U.K.